One thing I really learned during last year’s Jay festival is just how much omni restaurants go out of their way to provide a vegetarian menu for the festival’s duration. When I decided to go to Nara, it was a treat after spending many evenings on Yaowarat in Bangkok’s Chinatown, battling the biggest queues for the greatest jay finds. I was walking miles up and down the streets every night until late, and was exhausted. All I wanted was to put on my least filthy items of clothing and enjoy a meal in the comforts of an air conditioned restaurant. 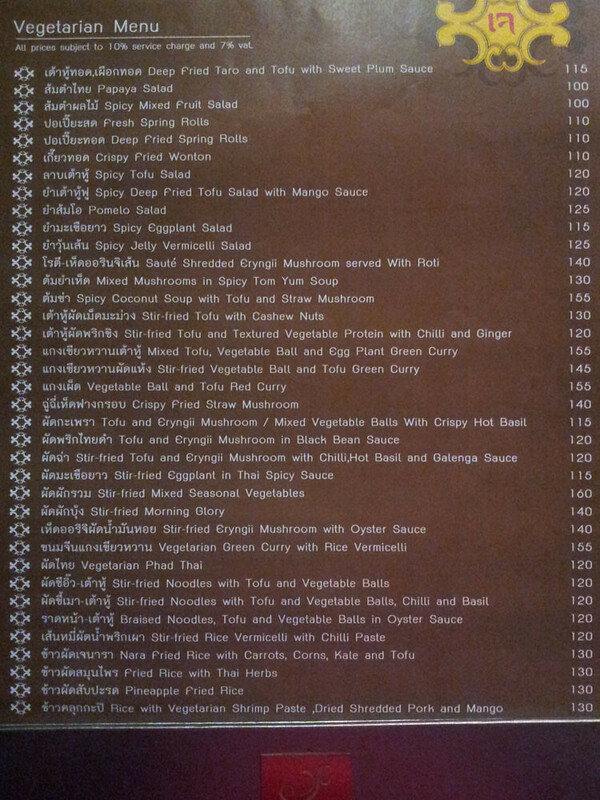 This proper sit down joint, on the 7th floor of Bangkok’s unmissable Central World shopping mall, offered a jay menu with prices of 100-160 baht per dish (it is worth noting Nara marks vegetarian items on their standard menu as well). My only complaint was being too short for the table, but I am also mostly too short to reach anything. Ever. I ordered the spicy deep fried tofu salad with mango sauce, which consisted of a bed of mildly salted deep fried tofu, mixed with some larger pieces of softer bean curd with a crispy fried exterior. The plate was topped with carrot, papaya, crispy nori, Chinese celery, and cashew nuts, and served with a thin, spicy-tangy mango sauce on the side. My wager on ingredients? Lime, mango, soy sauce, chili, and a touch of sugar. All mixed together, the salad took on an incredibly fresh taste, which is such a cliché descriptor in food writing, but sometimes, especially when describing good Thai food, that’s the only way to put it. Not at all heavy, despite the proliferation of deep-fry, the dish reminded me of a modern take on som tam. What a ingenious idea to top other dishes with this classic Thai salad. I left Nara feeling beyond satisfied, and fully intend to return upon my next visit to Thailand’s capital city. When a restaurant provides a completely jay menu, even if only during the too-short ten day Jay Festival, I trust they understand the concept well enough for me to return outside of that period and request menu alterations.